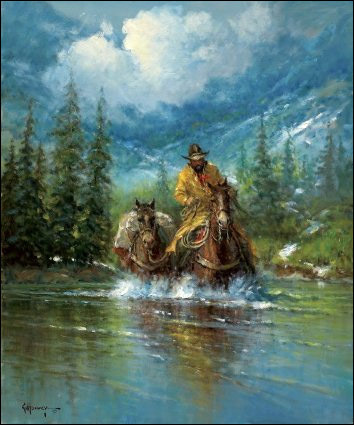 Early Spring Crossing depicts a cowboy on horseback crossing a mountain river with his pack horse in the early Spring. Early Spring Crossing copyright© 2008 by G. Harvey is prohibited from being copied. 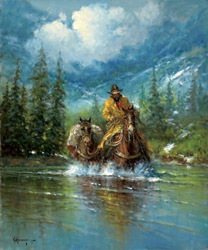 Early Spring Crossing by artist G. Harvey as well as other open and limited edition western paper art prints and canvases, giclees, images, lithographs, paintings, pictures, posters, and reproductions by renowned Somerset House Publishing and Texas Art Press artist G. Harvey can be viewed and purchased at special sale prices at Christ-Centered Art.